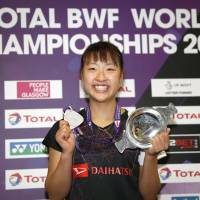 GLASGOW, SCOTLAND - Nozomi Okuhara had to endure a match for the ages in order to secure a historic triumph at the World Badminton Championships. Okuhara won the women’s singles title on Sunday, beating Pusarla Sindhu of India with a cross-court drop shot to finish the longest match of the championship and one of the greatest finals in badminton history. 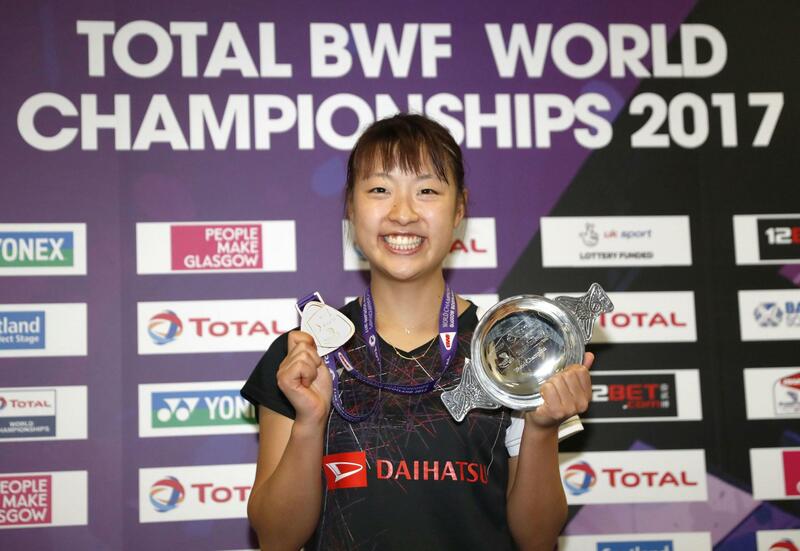 With both players almost dead on their feet after nearly two hours, Okuhara won the gripping final 21-19, 20-22, 22-20 to become the first women’s singles champion from Japan. “I am very tired,” said Okuhara, who won the bronze medal at the 2016 Olympics in Rio, where Sindhu was the silver medalist. The men also crowned a first-time champion, as Viktor Axelsen, of Denmark, held his nerve to win his first badminton world championship at the expense of his idol, Chinese great Lin Dan. When five-time champion Lin’s backhand couldn’t retrieve a smash, Axelsen won their final 22-20, 21-16 and turned to his coaches with shock on his face and his hands on his head. “Lin Dan is an idol for me, it’s just unreal,” said the first male champion from Europe in 20 years. In the women’s doubles final, Yuki Fukushima and Sayaka Hirota came up short in their bid to win Japan’s first doubles gold in 40 years, losing to China’s Chen Qingchen and Jia Yifan in the women’s doubles final. Fukushima-Hirota lost 21-18, 17-21, 21-15, settling for silver in the pair’s first appearance at the world championships. Etsuko Toganoo and Emiko Ueno won Japan’s last gold at the competition in the women’s doubles at the inaugural championships in 1977. In the women’s singles final, Sindhu, tall with a significant reach and two previous bronze medals from the world championships, looked stronger at the outset. But the smaller, speedy Okuhara suddenly found another gear and won the first game. Every rally seemed to be played as if it was match point, as they pushed each other to all corners; Sindhu patiently waiting for a floater to smash, and Okuhara setting up a drop shot winner. In the second game, Okuhara saved three game points by forcing errors; they played 33 shots for 20-20. On Sindhu’s fourth game-point, she won after a rally lasting 73 shots. The gasps from the crowd grew louder and louder until Okuhara batted the shuttle into the net and collapsed on the floor. Sindhu bent over, too tired to acknowledge the crowd’s standing ovation. Both players showed signs of fatigue in the third, but as tired they were, neither would concede. The rally for 13-13 went 42 shots. Okuhara was first to match point, but wasted it when she let a Sindhu shot sail past, and watched it fall in. Sindhu netted to give Okuhara a second match point, and the Japanese opened the court to make a drop-shot winner. Axelsen won the junior world title in 2010, but expectations of him cooled as he failed to produce a breakthrough win. He was third at the Olympics last year and won the World Superseries Finals in the absence of the resting big names. The breakthrough finally came this week, as he brushed aside Olympic, world and Asia champion Chen Long in the semifinals, and dismissed Lin without dropping a game to either Chinese star. He saved a game point for Lin in the first game of the final with a smash down the line, earned game point himself, and took it when Lin hit long. In the second game, Lin was strangely passive, and Axelsen ripped ahead 18-11. With yet another smash of another defensive return by Lin, Axelsen had four match points and converted the first. It was Lin’s first loss in a worlds final since his first, 12 years ago.